Finding cloth diaper fabric is easy - check out online fabric sources and local fabric stores. Consider recycling clothing and sheets and you may be able to diaper your baby for free! Making your own cloth diapers could save you hundreds of dollars in your baby’s first year alone. Cloth diapers used to come in one standard size. That meant folding diapers one way for newborns, a different way for babies and not folding them at all for toddlers. The problem with folding cloth diapers to fit is that they can be bulky. Creative moms and dads have come up with three sizes for cloth diapers. One yard of cloth diaper fabric will make two newborn, one and a half baby and one toddler sized diaper. Organic fabric for diapers includes hemp, bamboo, cotton and wool. Hemp cloth diaper fabric is durable, heavy and is usually blended 50/50 with 100% cotton fibers to improve flexibility. Bamboo is one of most popular organic diaper fabrics. It’s soft, has high absorbency qualities and is environmentally friendly. Both Hemp and Bamboo fabrics have natural antibiotic properties protecting skin. Birdseye Cotton (a loosely woven cotton) and 100% cotton flannel are also popular choices. Both are now available in many bright colors and patterns. They have both been the staples of cloth diaper fabric for centuries. Parents today are using Birdseye cotton as the inner part of sewn pre-fold diapers, with bright cotton flannel as the outer layer. Fleece is an absorbent, lightweight fabric that can be used to make pre-fold diapers, as well as diaper covers. Micro fleece works better than regular fleece for the inner liner, as it does not hold onto solid waste as tightly. Both of these fabrics can hold up to eight times their weight in moisture. They also wick moisture away from skin and are available in many thicknesses. Zorb is the newest diaper fabric made from bamboo, cotton, polyester micro-fibers and rayon. One layer of Zorb can hold up to three times its weight in moisture. Polyurethane Fabric known as PUL is a synthetic fabric that has a waterproof laminate backing. It was initially designed for medical use. Use this fabric as the outer layer of pre-fold diapers or diaper covers. Flannel sheets, shirts and pillowcases are great to use as cloth diaper fabric. 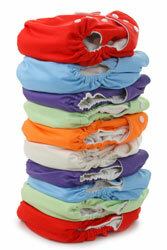 Fleece sweatshirts, blankets and sweatpants can also be cut apart and recycled for diapers. Another great option is 100% cotton bed sheets. Recycling old bedding and clothing into diapers provides a wide variety of colors, and helps reduce the amount of materials going into landfills. You will need to calculate how much diaper fabric to buy. Newborn diapers require one piece of fabric that is 23 x 15 inches. Infant diapers, (three to six months of age or so) will require one 27 x 20 piece of fabric. Toddler diapers require a piece of fabric that is 35 x 20 inches. Some toddlers may be larger and these sizes can be adjusted. The cost of cloth diaper fabric by the yard is still less expensive than buying ready-made pre-folded diapers and contour diapers. Some contour diapers can cost up to $8 a piece. Try using cloth diaper patterns to sew your own diapers and cut that cost by half at least. You will be able to find some of the more common diaper fabrics in your local fabric store. Some of the newer fabrics, however, you'll likely only find online. Tips on Sewing Fleece With Success!